Brett Lorenzo Favre was born on 10 October 1969 in Gulfport, the second of Irvin and Bonita Favre’s four children, who were raised in the nearby town of Kiln. Brett played multiple positions on the Hancock North Central High School football team, coached by his father. In 1987 Favre enrolled at the University of Southern Mississippi (USM), his father’s alma mater and the only school to offer him a scholarship. Coaches wanted him to play defensive back, but Favre opted to compete for the starting quarterback position. In his second game as a freshman, Favre entered the contest against Tulane in the third quarter and led USM to a 31–24 comeback victory. He started all but one of his remaining games at Southern Miss and led the Golden Eagles to a 30–26 upset victory over sixth-ranked Florida State in the first game of his junior year. The only game he missed was the season opener during his senior year: six weeks earlier, he had been involved in a near-fatal automobile accident that resulted in the loss of thirty inches of his intestines. On 8 September 1990 he returned to lead USM to a 27–24 win over thirteenth-ranked Alabama. 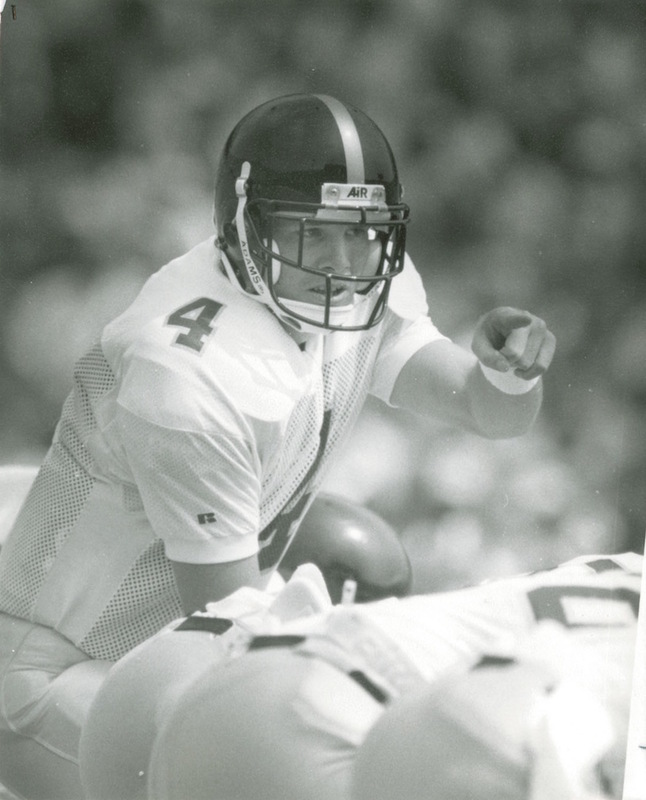 By the end of his time at Southern Miss, Favre had set school records in numerous passing categories, including career yards (7,695), completions (613), attempts (1,169), touchdowns (52), and 200-yard games (15). During 1989, he set the school’s single-season records for passing attempts (381), completions (206), yards (2,588), and touchdowns (16). That year, he also established school records for completions in a game (26 against East Carolina) and yards in a game (345 versus Memphis State). The Atlanta Falcons drafted Favre with the thirty-third pick in the 1991 National Football League (NFL) draft. Favre spent one unremarkable season with the Falcons: Washington linebacker Andre Collins intercepted Favre’s first regular-season pass and returned it for a touchdown, and Favre attempted only three other passes. Atlanta subsequently traded Favre to the Green Bay Packers in exchange for a first-round pick in the 1992 draft. With Green Bay, the man who wore jersey number 4 reached legendary status. Favre played sixteen seasons in Green Bay, starting every game as the Packers’ quarterback from 20 October 1992 through 20 January 2008. He led Green Bay to seven National Football Conference (NFC) Central/North Division Championships, four NFC Conference Championships, two Super Bowl berths, and the 1997 Super Bowl Championship, a 35–21 victory over the New England Patriots in Super Bowl XXXI in New Orleans, just sixty miles from his childhood home. Favre holds every major Packers’ passing record. In 2005 Favre had one of his statistically worst seasons. He threw a career-high 29 interceptions, had a career-worst 70.9 passer rating, and threw only 20 touchdowns. When the season ended, Favre said that 2006 would be his last. However, he subsequently changed his mind, and declaring that a year would be his last but then playing longer became a common theme in his final seasons. In fact, 2007 proved a renaissance year in Favre’s career. He led the Packers to 13 regular-season wins, tying a franchise mark, and an appearance in the NFC Championship game. Favre also reached numerous personal milestones, setting NFL career records career for wins as a starting quarterback (149), touchdown passes thrown (421), pass attempts (8,393), touchdown passes of 75 yards or more (13), three-touchdown games (63), passing yards (61,362), and interceptions thrown (278). Sports Illustrated named Favre its Sportsman of the Year, and he started for the NFC in the 2008 Pro Bowl. He then formally announced his retirement on 4 March 2008. Favre later stated that he had felt pressured to make a decision regarding his playing future and regretted his choice. He applied for and was granted reinstatement, and in August 2008 the Packers traded him to the New York Jets. Favre led the team to a 9–7 record before retiring again, and the Jets released him from all contractual obligations. Favre again changed his mind about retiring and signed with the Minnesota Vikings on 18 August 2009. The Vikings went 12–4 in the regular season and lost to eventual Super Bowl champion New Orleans in the NFC Championship game. He played a second season with the Vikings, starting 13 games for the team and compiling a 5–8 record, before injuries finally ended his career in December 2010. Favre is one of the most decorated quarterbacks in NFL history. He started a league record 297 consecutive regular-season games and holds career regular-season records for passes attempted (10,169), passes completed (6,300), and victories as a starting quarterback (186, tied with Peyton Manning). He was elected to eleven Pro Bowls and selected to six first- or second-team all-pro rosters. Favre has always made his permanent home in Sumrall, Mississippi, near Hattiesburg. USM retired his jersey number in 1993, inducted him into the university’s Sports Hall of Fame in 1997, and named him to its Football Team of the Century in 2001. On 18 July 2015 the Green Bay Packers inducted Favre into the team’s Hall of Fame and retired his number. He appeared on the 2016 ballot for the NFL Hall of Fame and easily won election. Since his retirement, Favre has remained one of Mississippi’s most recognizable public figures. He has served as a football coach at Lamar County’s Oak Grove High School, has done extensive charitable work, and has appeared in numerous commercials.